The Alagxa Plateau, in the margin of the northeastern Tibetan Plateau, is one of the most important dust source areas in East Asia, and the widespread sandy desert in the area is important both as a reservoir and a source of eolian silty. The northeastern margin of the Tibetan Plateau is one of the most actively-growing mountain belt on earth, and has large amounts of debris, with masses of fine grained material, which were continuously mobilized and deposited in the Alagxa Plateau by rivers, forming broad alluvial fans. It is possible that the role of fluvial sediments as a source of silty dust in the Alagxa Plateau has been underestimated. 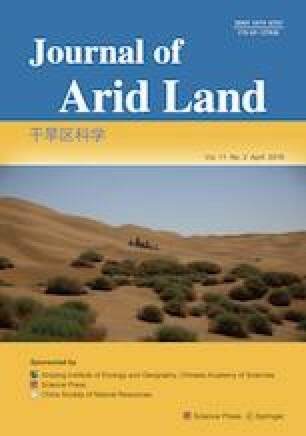 In this study, we test this hypothesis by investigating the iron mineralogical and geochemical characteristics of the fluvial sediments and the surface material of the sandy desert in the Alagxa Plateau, and comparing them with paleo-eolian dust deposits (loess) in the adjacent Chinese Loess Plateau (CLP) to investigate the possible linkages among the fluvial sediments, sandy desert and the last glacial loess of the CLP. The results show that sandy desert typically have high contents of goethite, and high ratios of goethite to hematite, similar to the fluvial sediments in the Alagxa Plateau. Based on the major element characteristics, field investigations and the results of previous studies, we found a genetic link between the silt component of the fluvial sediments and the sandy desert in the Alagxa Plateau with high value of Gt (goethite) and similarity of the Gt/(Hm (hematite)+Gt) ratio. But the silt component of the sandy desert main come from the adjacent fluvial sediments. The iron mineralogical characteristics (χ (magnetic susceptibility), χARM (anhysteretic susceptibility), SIRM (saturation isothermal remanent magnetization) and SIRMAF100mT (SIRM demagnetized at 100 mT)) of the CLP samples overlap with those of the fluvial sediments in the Alagxa Plateau, but there is a mismatch with the sandy desert samples. This suggests that the fluvial sediments are the source of a large amount of silty material which could be transported to the CLP. Therefore, we conclude that the fluvial sediment in the Alagxa Plateau is an important source of eolian silt, which is deposited in downwind region, and that this source has been previously underestimated. This study was supported by the National Natural Science Foundation of China (41401046) and the Fundamental Research Funds for the Central Universities (lzujbky-2016-264, lzujbky-2016-bt01). We thank Dr. Jan BLOEMENDAL for critical discussions, constructive suggestions and English language improvement.